This handling is simply to get the deck into the order needed for the effect. Therefore, you can do it casually as you go into your preliminary patter or even do it between effects. The order of the deck from the top down is now: thirty-nine facedown cards, twelve face-up cards, and one facedown card. Talk about the various ways of shuffling cards. To illustrate, you perform an overhand shuffle, then a Hindu shuffle, and finally a faro shuffle. During these shuffles, you must, of course, both preserve and conceal your bottom stock of face-up cards. For the overhand shuffle, perform Erdnase's bottom stock shuffle control. Overhand shuffle about two-thirds of the deck. Then injog the next card, and throw the rest on top. Your right thumb now pulls in on the jogged card as your left thumb holds all the cards above the jog in place. (See illustration 1.) Your right hand picks up all the cards up to and including the jogged card and shuffles them onto the cards retained by the left hand. This returns your stock intact to the bottom. For the Hindu shuffle, lift about two-thirds of the deck and shuffle it onto the remainder. The purpose oi these iirst two shuffles is simply to subtly convey to the audience that all the cards are face down. The overhand shuffle is particularly convincing in this regard. Push the two halves together until they are telescoped for exacdy half their length. Keeping the elongated deck on it's side, hold it with your left hand, thumb on the upper edge, the second, third, and fourth fingers on the lower edge, and the forefinger curled against the face. Stretch your right hand across the back of the deck so that your thumb presses against the upper inner corner and your third finger presses against the lower outer corner, illustration 2 shows this position. Keep in mind, however, that this view is from the right side; the deck is still on its edge. 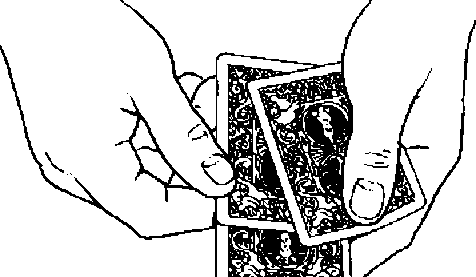 Cascade the two halves together, pressing with your right thumb and third finger so that the cards bend over your curled left forefinger as in illustration 3. If you do this correctly, the two halves should end up squared at the ends but un-squared at the sides. In fact, the half originally held by your right hand will be strongly jogged upward. This will take a little practice to get right. It's a matter of finding the right amount and direction of pressure with the right thumb and third linger in cascading the cards. You must be careful not to flash the reversed cards as you cascade the halves together. The key is how you posi- * A.
tion your left hand. The lingers should curl around the lower outer corner as shown in illustration A. Some practice in front of a mirror will show you what's needed. Angling the elongated deck slightly toward the left will provide more cover. 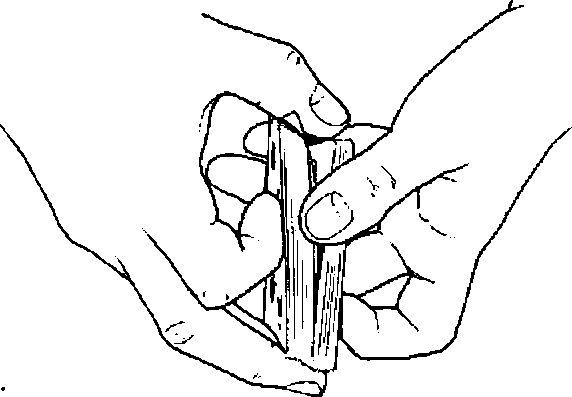 Take the deck in dealing grip in the left hand, your right hand arched over it, covering the right-jogged cards. Squeeze the halves together between your left thumb and fingers until the side-jog is slightly less than half an inch. The front edge of the deck should be toward the audience. This, combined with the position of your right hand, will obscure the un-squared condition of the cards. Due to the side-jog, every visible card in the ribbonspread is concealing another card beneath it. Therefore, the twelve face-up cards will not show. This convincing display that the cards are all face down is what makes the trick a miracle. Therefore, give the audience a good chance to look at the spread while, at the same times, not making a big deal about it. Explain that you're going to attempt an experiment in shuffling. (This ties in with your earlier patter about different ways oi shuffling.) But first, you explain, you re going to divide the deck between the spectator and yourself. You will divide the deck in the middle. It's important, however, that the upper half contain exactly twenty-four cards and the lower half twenty-eight. Since each visible card is concealing another card under it, if you count over twelve cards from the right (top) end of the spread and split there you'll have the right number in each half. You don't, however, want it to be apparent that it matters where you divide the spread. I sight-count four cards (actually pairs) from the top and point to the spread at exactly that spot as I patter. My forefinger now provides a visual marker from which I can sight-count another four cards. I point at this new spot as I con-tinue pattering. I then sight-count four more cards and split the spread at that point. When you divide the spread you 11 expose one of the side-jogged cards. Don't worry about this; it won't mean anything to the audience. In fact, it wouldn't matter if you split the spread slightly higher. But it would matter if you split lower. If you were to split the spread too far down, that jogged card would be a face-up card. Keep that in mind as you sight-count for the split. Gather up the lower half of the spread. In order to avoid the risk of exposing any face-up cards, do it this way. Place one hand on either end of this lower half of the spread. Keep the right hand stationary as your left hand scoops the cards up against it. Have the spectator place her hand on these cards. Gather up the remaining cards and spread them between your hands as you observe, "As long as you keep your hand on your cards there's no way I can make my cards change places uiith yours. So VU try something far more difficult. lm going to shuffle my cards in an unusual way. Im going to mix face-up cards with facedown"
Suiting action to words, perform Sid Lorraine's slop shuffle. For those who may not be familiar with this standard maneuver, here is a brief description. 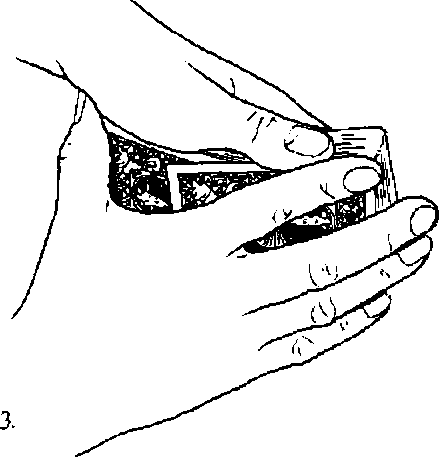 Thumb over three or four cards into your right hand. 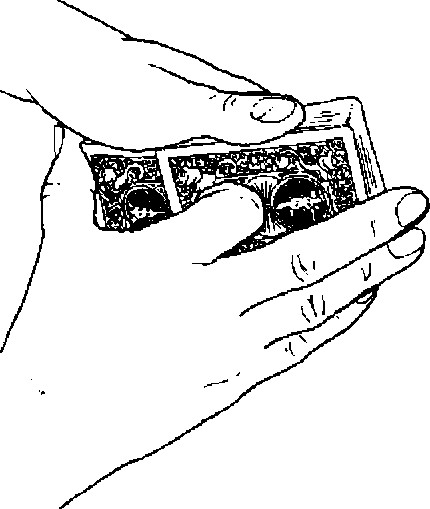 Turn your right hand palm down and thumb over three or four cards under the ones you're already holding. 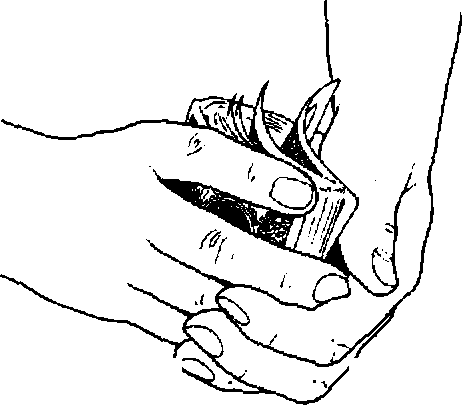 Turn your hand palm up again and thumb over three or four cards under those you're already holding. Keep up this alternating palm-up/palm-down action until your leit hand holds only one card. Turn your right hand palm up and place this single card on top. This procedure appears to intermingle face-up and facedown cards. In fact, however, the bottom half consists entirely of facedown cards and the top half consists entirely of face-up cards with a single facedown card on top of all. two packets together. The shuffle does not have to be perfect as long as the facedown card on top of the right-hand packet goes second or third from the top, You can play up the fairness and thoroughness of this shuffle as you push the two packets together. This shuffle considerably enhances the illusion created by the slop shuffle. At the same time, it straightens out the packet. Every card is now face up except for the one second or third from the top. Spread over the top couple of cards as you comment about the topsy-turvy condition. As you do so, casually flip over the one facedown card as if to emphasize your comments about some cards being face up and others face down. Take the packet in your right hand from above and rub it against the back of the spectator's hand. Ribbonspread the cards to show that the packet has straightened out. Have the spectator lift her hand. Ribbonspread her packet to show that it's now mixed face up and face down. You'll find this a stunning climax. It seems utterly impossible that you could have altered the condition of the spectator's cards while she guarded them. My patter during these final actions is, Tf J rub my cards tihe this, in that instant they straighten out. And, if you lift your hand, you'll s&e that your cards now contain my mess."